Construction of Kashima Soccer Stadium started in March 1992 and was completed just over one year later. The stadium officially opened on 4 May 1993 with a friendly between Kashima Antlers and Brazilian side Fluminense (5-0). The stadium was one of the first football-specific stadiums in Japan and could initially hold 15,000 spectators. Between 1999 and 2001 the stadium got further expanded to be eligible to host matches at the 2002 World Cup. During the World Cup, Kashima Soccer Stadium hosted three group matches. In March 2011, the stadium sustained small damages resulting from the Tohoku 9.0 earthquake. Kashima Soccer Stadium is located just north outside of the small city of Kashima, about 3 kilometres from central Kashima and the Kashima Shrine. The stadium can be best reached by train. Train station Kashima Soccer Stadium is located right next to the stadium, though the station is only in use around football games. Kashima Soccer Stadium Station is on the Kashima Line. Trains can be boarded from Kashima-Jingū station in central Kashima or from Katori Station. Katori Station can in turn be reached from Sakura (Chiba) or Narita with trains from the Narita Line. These latter destinations can be reached from Tokyo Station. There is furthermore one direct daily train (Ayame) between Tokyo Station and Kashima-Jingū station. On matchdays there are also shuttle buses running between Kashima-Jingū station and the stadium. Tickets for Kashima Antlers games can be bought online, at the official club shop at 2887 Aou Higashiyama in Kashima (not a very central location), at the club store at Mito train station, or at any of the 7Eleven, FamilyMart, Circle K, Pia, or Lawson convenience stores nationwide. Tickets can also be bought at the stadium on the day of the match. Kashima Antlers does not tend to sell out a typical home match. Ticket prices range from Y$2,300 for a seat behind the goal to Y$4,500 for the best seats at the main stand. Tickets are up to Y$1,000 more expensive if bought on the day of the match. 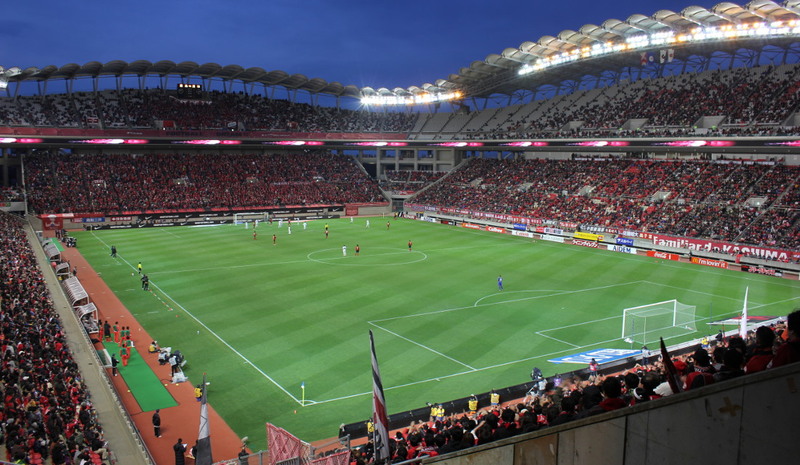 Kashima Soccer Stadium offers guided stadium tours that include several exhibitions and last about 70 minutes. Tours run on selected days and times each month. See the official website for current ones. The stadium also houses the Kashima Soccer Museum, which opens Monday to Saturday from 10:00 am to 4:00 pm. The tour plus museum costs Y$1,000. So-net.ne.jp – Official website of Kashima Antlers FC.